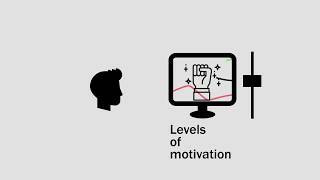 This component allows assessing the player's motivation based on in-game events. Short non-technical description: This component includes three major motivation aspects – attention, satisfaction, and confidence. We assumed the game to be split up in closed game situations, in which the player solve given tasks. Solving time (timespan between task start and successful attempt to solve the task). The motivation aspect satisfaction updates based on the in-game achievements, i.e. it upgrades every time the player reaches a new level. Reverse, when such an achievement is not reached in a given time period the satisfaction downgrades. The aspects attention and confidence are evaluated together. If the player answer too fast, i.e. the reaction time is shorter than the time to understand the given task, the attention downgrades. The player is most likely guessing; all other information about the motivation quantities is ignored. An appropriate reaction time leads to an evaluation adapting both motivation aspects – attention and satisfaction. First, the solving time is compared to a maximal solving time. If it is fine, the motivation aspect attention upgrades. A too long solving time leads to a higher attention value. Second, the help requests and error guesses are compared against their upper restraints. If one of them is too high, the motivation aspect confidence downgrades. If both values are fine the confidence upgrades.